The Zodiac deck was produced by the USPCC and released around the same time as the Bicycle Gong Xi Fa Cai (late 2010). 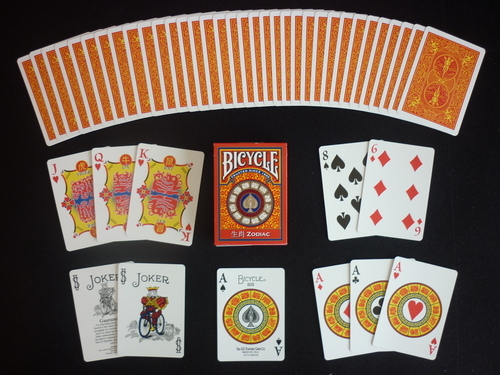 It features red and yellow Rider Backs and is one of the few newer Bicycle decks that does not have standard faces. The corner indices are of a slightly bigger and different style, and the court cards have two-way designs of the 12 chinese Zodiac signs on them. Comes with 2 Jokers, one in full colour and one guarantee, and 4 custom aces.